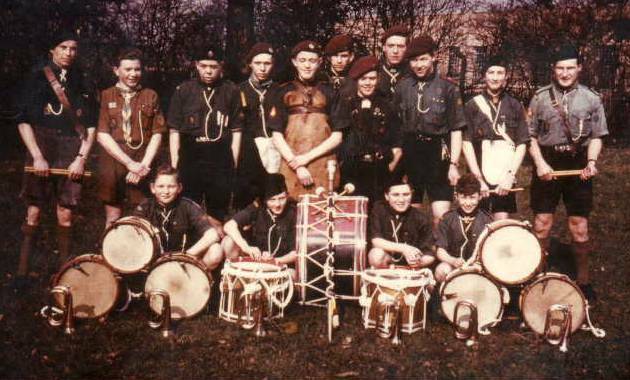 Before 1962, 1st Shirley Scouts Drum and Bugle Band had a successful existence, little knowing what was in store. Of those in the photos below, Mick Mason became the first Drum Major of the Pipe Band, and Graham Ricketts a tenor drummer. Click on a thumbnail photograph to see a larger version. Names are listed left to right unless stated. Standing: Mick Mason, ? (from Monkspath? ), Lenny Ricketts, Bob Knight, Robin ?, Mike Seeny, David (Percy) Proctor, Graham Ricketts, ?, Tony Pielow, ? Sitting: ?, Chris Brown?, Brian Hall, ?